You Taste 16 Chards, and What Do You Get? As I sit down to write this post, the pressure’s on to make it a good one—given that it comes after a month-long blogging hiatus and will be one of my last, at least for a while…. 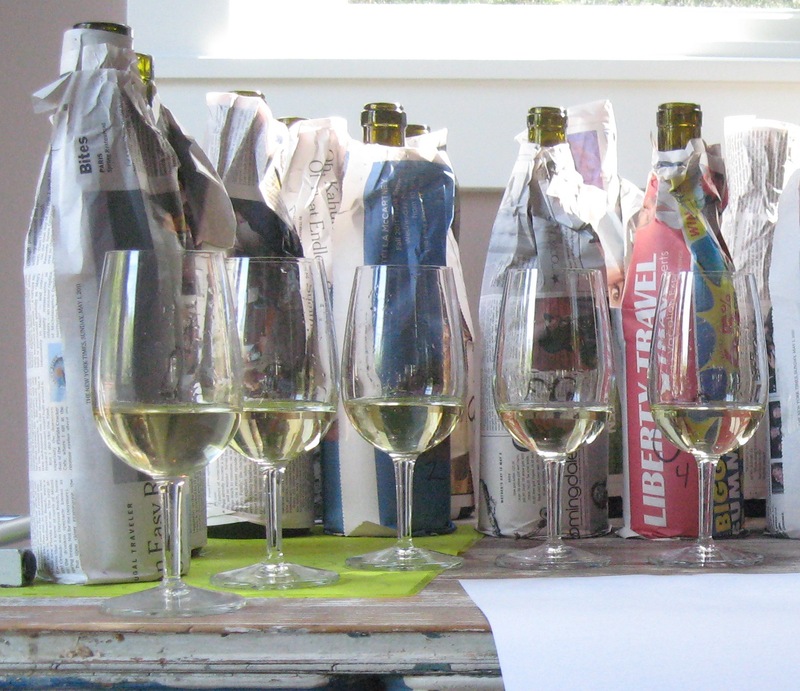 Luckily I’ve got some good material to work with: notes on over a dozen Chardonnays, which we uncorked and tasted blind over the weekend. Peter did a preliminary tasting of all the wines, proclaiming 10 to be worth a second pass. The thing that I found most notable about our results was that we both picked the same wine as our favorite. And, in a sea of Chards ranging in price from $13 to $48, it was the least expensive. The winner: the 2009 L de Lyeth Sonoma County Chardonnay (the Sonoma County designation just means that the wine was made from grapes grown in different areas of the county, rather than just the Russian River Valley, say, or just the Sonoma Coast). It was more vegetal than fruity on the nose, with notes of straw and caramel. This unusual wine was delicately prickly on the palate and had a long and pleasant finish. Runner-ups in the 2009 vintage included Kendall-Jackson’s Avant California Chardonnay ($14, medium-bodied and smooth, with a nice aroma of tropical fruit) and Clos du Bois’ Russian River Chardonnay ($18, lemon on the nose, lots more citrus on the palate, and great balance). In the 2008 vintage we liked Kendall-Jackson’s Grand Reserve Monterey/Santa Barbara Chardonnay ($20, a figgy aroma and notable residual sugar), Cambria Estate Winery’s Katherine’s Vineyard Chardonnay ($22, nicely balanced, with a bouquet of straw and a rough-silk mouthfeel); Mantanzas Creek’s Sonoma Chardonnay ($29, banana on the nose, light and smooth); and Waterstone’s Carneros Chardonnay ($18, grapefruit aroma, light and creamy). Kendall-Jackson Grand Reserve has moved on to the 2009 vintage, but given its impressive 2008 showing, the new vintage is well worth a try. And if you do try it, consider drinking a toast to Jess Jackson, the California wine industry giant who passed away on April 21st.